Braunschweig - Alexander Meier’s 50th Bundesliga goal set Eintracht Frankfurt on the way to a 2-0 win over Eintracht Braunschweig and their first three points of the season. Meier's deflected shot broke the deadlock when it seemed Frankfurt were not going to find a way through a stern Braunschweig defence. Stefan Aigner then made it two to earn the Eagles their first points of the season and leave their hosts yet to get off the mark. New recruit Karim Bellarabi went straight into the Braunschweig squad, making his return to the club he last played for on 30 April 2011. 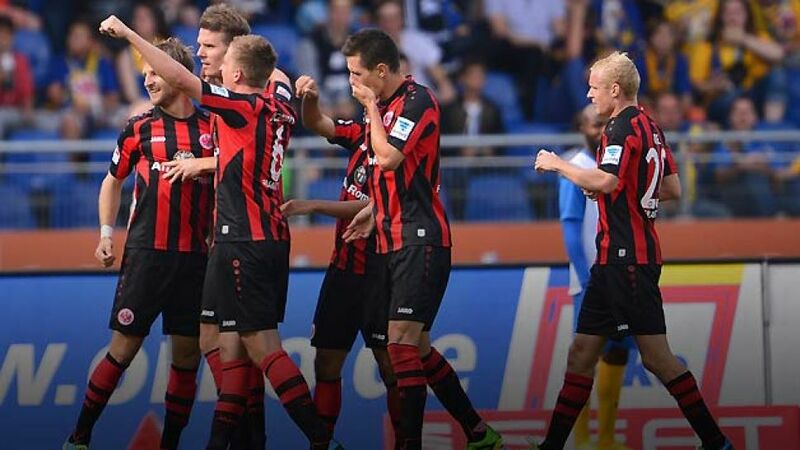 That game came in the third division and they have been promoted twice since then, but Frankfurt soon set about showing how the Bundesliga is a cut above what Braunschweig have been used to in recent years. It was all one-way traffic initially, with Takashi Inui sending the first shot in with a deflection taking the ball wide. The Japanese international was proving to be a real menace for the home team’s defence as he switched from right to left to find room for shots and hit the outside of the post after ten minutes when Daniel Davari could only parry Sebastian Rode’s effort. After just 20 minutes, the statistics reflected the guests’ dominance with 70 per cent possession and eight shots on goal compared to just one for Braunschweig. Just ten minutes later, as Alexander Meier missed the target, Frankfurt had already chalked up more chances than in each of their first two games of the season. Braunschweig had tested Kevin Trapp just once in that same phase, but they had the biggest chance to take the lead when Carlos Zambrano got caught in two minds as he guided the ball back to his goalkeeper, allowing Simeon Jackson to steal in and almost beat Trapp, who blocked with his chest. Yet the visitors' pressure eventually told when Meier’s shot took a wicked deflection off Ermin Bicakcic on its way past Davari. It was just the stroke of luck the Eagles needed and their second goal followed moments later when Omar Elabdellaoui gave away the ball in the worst possible of positions, playing the ball across his own penalty area and finding Frankfurt's Aigner, who accepted the gift to score his first goal in ten games with a composed finish. Bellarabi was sent into the fray and Dominik Kumbela marked his return to action after a four-month injury absence, but neither could alter the outcome. Bellarabi showed some inventive touches, while Kumbela appeared a little rusty with his first chance, providing a weak finish in front of Trapp. He did better with his next two attempts, but Trapp was not going to be beaten as Frankfurt took the points.